The Comp Road Shoes offer the security and adjustability of our high-end Boa® road shoes plus theyre paired with a nylon sole and Body Geometry technology to deliver best-in-class performance and value. Cyclestore.co.uk carries the full range of Specialized clothing and accessories. To find out more about Specialized clothing and accessories, go to the Specialized Equipment homepage. Body Geometry sole construction and footbed: ergonomically designed and scientifically tested to boost power increase efficiency and reduce chance of injury by optimizing hip knee and foot alignment. Injection-molded nylon composite sole is engineered to be moderately stiff yet light: Stiffness Index 6.0. Lightweight Boa® S2-SV dial closure for on-the-fly micro-adjustment backed by Boas® Lifetime Guarantee. Synthetic upper with mesh venting for supple fit. Reflective heel elements for high visibility. Please see below for delivery options for Specialized Comp Road Shoe 2018. If you do not see your country listed below please email [email protected] with details of products you wish to order and we will reply shortly with shipping costs and options. "Really pleased with product and service. I have wide feet and the specialized shoes are a good fit for me. Nice stiff soles so find you get good power transfer and with combination of Velcro straps and tensioner you can get a good fit. I’ve had quite a few pairs of specialized shoes beforvand they last for ages. The colour is pretty funky, more fluorescent orange than red. As they were half price I can live with that though"
"Just received my new Specialized Comp 2017 road shoes. Firstly, what a fantastic service by Cyclestore! The free, tracked postage was very quick. 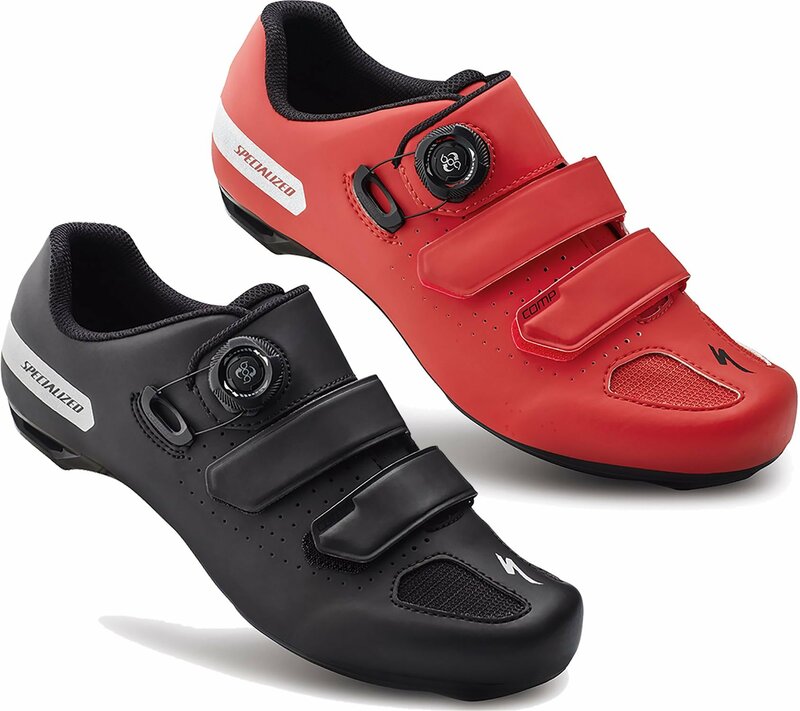 The shoes are what I have come to expect from Specialized, high quality. I have been making do with my Specialized Comp MTB shoes since moving back to road cycling. The road shoes have been very comfortable from the off. Having a broad foot I always go a half size higher for cycling shoes. I have definitely noticed a positive improved power transfer, particularly out of the saddle. 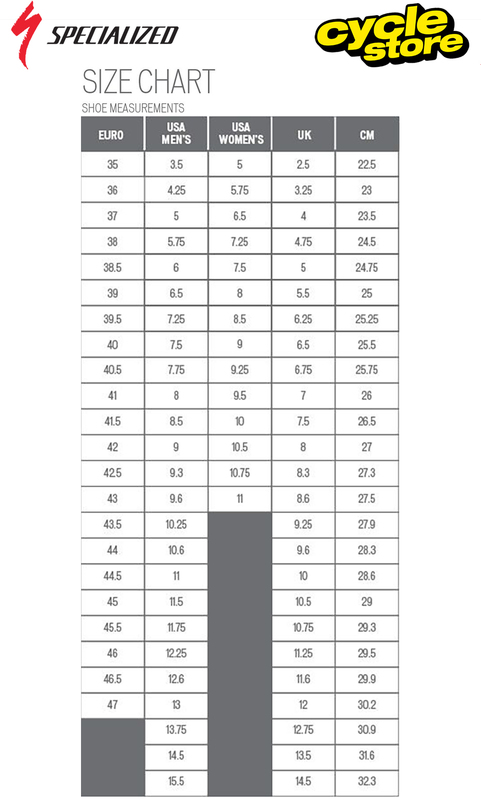 The stiffness of the sole is more than adequate for my level of riding. Excellent product. The overall experience with Cyclestore is highly recommended." Cyclestore Newsletter Get a £5 voucher* when you sign up to our newsletter.